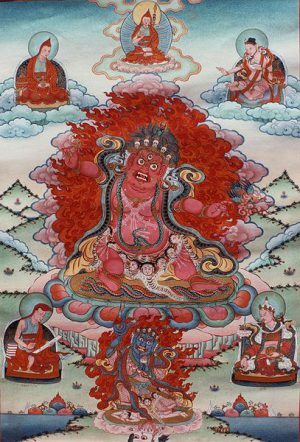 This event at CGF Rigdzin Ling will focus on Hayagriva, a red wrathful form of Amitabha, Chenrezig and Guru Rinpoche. This meditation practice is part of the Longchen Nyingtik (Heart Essence of the Vast Expanse), a profound Dharma treasure revealed by the great master, Jigmed Lingpa. This particular aspect of Hayagriva, as an expression of wisdom and compassion, is known as Takhyung Barwa, the Horse-headed One with a Garuda. The benefits of this practice are especially powerful during turbulent times in uprooting the causes of imbalance and conflict–in the outer world, in physical health and inner emotions. Jigme Tromge Rinpoche, who has a profound connection with this Longchen Nyingtik practice through the blessings of Chagdud Tulku Rinpoche, Khenpo Ngagchung Rinpoche and his own deep realization, will be leading and guiding this retreat. For pricing and to register for this event, Click Here.